– Senior Judge John C. Coughenour of the Seattle-based U.S. District Court for the Western District of Washington, quoted by New York Times reporter Kirk Johnson in an article on Wednesday's 2d resentencing of Ahmed Ressam. Months before the terrorist attacks of September 11, 2001, a federal jury had convicted the Algerian-born defendant of a 1999 plot to set off a bomb at Los Angeles International Airport. Ressam cooperated with the government respecting other cases, and so his sentence was delayed until 2005, well into the aftermath of 9/11. At each sentencing hearing, the government sought higher sentences than the judge imposed, and the appeals court reverse. At Wednesday's resentencing, the government sought life in prison; the judge levied a term of 35 years. The above-quoted comment by Coughenour, an appointee of President Ronald Reagan, reflected the judge's criticism of that prosecutorial stance. Prosecutors justified it by pointing to the defendant's recantation of incriminating statements. The judge found the recanting to be "a deranged protest" against the sentence Ressam's already served – more than a dozen years so far, much of it in solitary confinement. The judge's position bears added note given Hamdan v. United States (October 16, 2012), in which the U.S. Court of Appeals for the District of Columbia Circuit reversed the 1st military commissions conviction after trial. The circuit opinion was written by Judge Brett Kavanaugh, an appointee of President George W. Bush, who established the military commissions at Guantánamo. 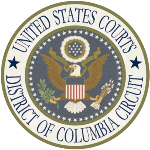 The D.C. circuit held that at the time the accused, Salim Ahmed Hamdan, acted, the sole count of conviction, material support for terrorism, was not a war crime under controlling international law.